Magnificent views over the unspoilt countryside to the sea in Start Bay is just one attraction to this detached property which is very nicely situated on the southern edge of this unspoilt picturesque village just one mile from Slapton Sand and has been, until recently, successfully let as a holiday home. In addition to the large garden are two paddocks totalling two acres on part of which outline planning permission was granted on 28th January 2018 for the construction of two detached dwellings, application number 1736/17/OPA from the South Hams District Council. With the elevated position of the property the development will not restrict the far reaching views or deter from the enjoyment of the southerly facing garden and remaining paddock which provides a wonderful space for family hobbies and activities. The plots will have an area in the region of one third of an acre each nestling very nicely into the gently sloping hillside and having a southerly aspect. 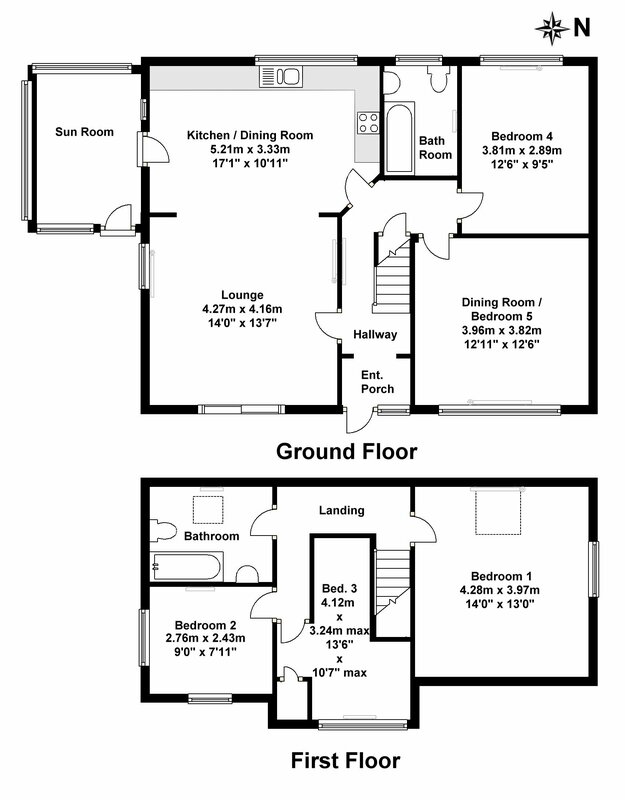 The plans showing two storey dwellings of approximately 1800 SQFT. Detached block built Garage 7.4 x 4.3 ( 24’3” x 14’1”), with large sliding wooden door, lights inside and out. Entrance drive over cattle grid to large tarmac parking area from where the property, gardens and grass track to the fields are accessed. To the front of the property is a pathway below which heathers and flower beds lead onto a large lawn surrounded by hedging, small trees, flowering shrubs and along the bottom a grass bank. The lawn bounded by a hedge continues to the side linking with the rear level garden again laid to grass. Within the garden are block built sheds, two providing storage and a third housing the oil fired boiler supplying the central heating and hot water systems. To the rear is a screened oil storage tank. Lying to the east and gently sloping away from the property is a field laid to grass of approximately 1 acre accessed over the grass track to the side of the garden. It is this field that has the benefit of the planning permission. From this field a gateway in the south west corner leads to a second near level field lying to the south of the property laid to grass of approximately 1 acre. Both fields are largely bounded by earth banks and hedges. The planning documents can be viewed on the South Hams District Council website. To access application number 1736/17/OPA. Exciting new development opportunity. Detached 2 reception, 4 bedroom property and land of two acres with planning permission for two detached dwellings on village outskirts. Magnificent views to the sea, southerly facing. Energy Rating - D.